Received October 7, 2018; Revised December 24, 2018; Accepted January 4, 2019. An assay for detecting Apple scar skin viroid (ASSVd) was developed based on nucleic acid sequence based amplification (NASBA) in combination with real-time detection during the amplification process using molecular beacon. The ASSVd specific primers for amplification of the viroid RNA and molecular beacon for detecting the viroid were designed based on highly conserved regions of several ASSVd sequences including Korean isolate. The assay had a detection range of 1 × 104 to 1 × 1012 ASSVd RNA copies/μl with reproducibility and precision. Following the construction of standard curves based on time to positive (TTP) value for the serial dilutions ranging from 1 × 107 to 1 × 1012 copies of the recombinant plasmid, a standard regression line was constructed by plotting the TTP values versus the logarithm of the starting ASSVd RNA copy number of 10-fold dilutions each. Compared to the established RT-PCR methods, our method was more sensitive for detecting ASSVd. The real-time quantitative NASBA method will be fast, sensitive, and reliable for routine diagnosis and selection of viroid-free stock materials. Furthermore, real-time quantitative NASBA may be especially useful for detecting low levels in apple trees with early viroid-infection stage and for monitoring the influence on tree growth. Ten scion cultivars (Beni Shogun, Chukwang, Fuji, Gamhong, Hongro, Hwahong, Jonagold, Sansa, Seokwang and Yoko) and ten rootstock cultivars (M.9, M.9 EMLA, M.9 T337, M.26, M.27, Ottawa 1, Ottawa 2, P.2, P.22 and Pajam 4) grown at the orchard of National Institute of Horticultural and Herbal Science (NIHHS) were used in this study. ASSVd-infected scions were collected from infected mother stock. To avoid uneven viroid distribution, leaves were collected from different parts of randomly selected stems from each cultivar. Viroid RNA was extracted from infected leaves using the NucliSens® Basic Kit (BioMérieux Inc., Durham, NC, USA) based on the modified method of Boom et al. (1990) as recommended by the manufacturer. The leaves were pulverized in a mortar and pestle using liquid nitrogen and then resuspended with 1 ml of Nucli-Sens® lysis buffer consisting of 5 M guanidine isothiocyanate, 0.1 M Tris-HCl (pH 6.4), 20 mM EDTA, and 1.2% Triton X100 (w/v) with 2% polyvinylpyrrolidone. After centrifugation at 16,000 × g for 15 min, 600 μl of the supernatant was transferred in NucliSens® extractor cartridge supplemented with 50 μl silica suspension. Total nucleic acids were extracted with NucliSens® automatic extractor. Briefly, nucleic acids bound on silica were washed twice with 1 ml NucliSens® wash buffer consisting of 100 mM Tris-HCl (pH 6.4) and 10 M guanidine thiocyanate, twice with 1 ml 70% ethanol and once with 1 ml acetone and dried at 56°C for 10 min. Purified RNA was eluted in 50 μl elution buffer at 56°C for 10 min and stored at −70°C until use. The ASSVd specific primers, P1 and P2, for amplification of the viroid RNA were designed based on highly conserved regions of selected ASSVd isolates and our sequence of ASSVd isolate collected from ‘Hongro’ cultivar in this study. The alignments were carried out by Clustal W method with Lasergene 7 Megalign (DNAstar, Madison, WI, USA) (Fig. 1). Primers and molecular beacon were designed on the manufacturer’s recommendations using the program Beacon Designer (Premier Biosoft, Palo Alto, CA, USA). Molecular beacon carries a fluorogenic reporter molecule (6-carboxyfluorescein, FAM) at the 5′ terminus, while the arm sequence at the 3′ terminus is covalently linked to a quenching dye (4-(4-4dimethylaminophenylazo)-benzoic acid, DABCYL). Formation of hairpin structure of molecular beacon was predicted by the mfold DNA folding program (Zuker and Stiegler, 1981) for single-stranded DNA. Primers and molecular beacon were synthesized and HPLC-purified. The sequences and positions of the primers and molecular beacon were listed in Fig. 1 and Table 1. A dendrogram was constructed using all sequences of ASSVd isolates from the Genbank of NCBI (accessions AF421195, DQ362906, DQ362907, EU031455, EU031456, U031467, EU031477, EU031487, HG764197, HG764198, G764199, HG764200, HG764201, HG764202, G764203, HG764204, HG764205, HQ840722) with our sequence identified in this study (Fig. 2). The ASSVd sequence which is confirmed in this research belonged to the distinct clade which is contained in ASSVd-K with high similarity. Using MEGA X (Kumar et al., 2018) software, we calculated the genetic distance between ASSVd isolates including our sequence and used the maximum likelihood method based on the Tamura-Nei model with 1,000 bootstraps. 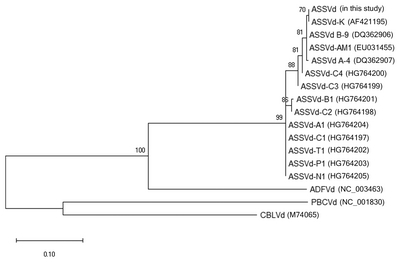 In dendrogram, ADFVd (NC_003463), CBLVd (M74065), PBCVd (NC_001830) were used as the outgroup of ASSVd isolates belong to the genus Apscaviroid. ASSVd-specific forward and reverse primers reported by Lee et al. (2001) were used for the reverse transcription and PCR amplification of ASSVd RNA molecules. RT-PCR was performed in 50 μl reaction volume containing 5 μl of total RNA, 25 μl of 2 × AccessQuick™ master mix (Promega, Madison, WI, USA), 1 μl of 5 U AMV reverse transcriptase, and 33 pmole each primers. Amplification was carried out in a thermocycler (PTC-220, MJ Research, St. Bruno, Quebec, Canada). Reaction mixture was incubated at 42°C for 70 min. Then PCR was performed at 94°C for 5 min, followed by 40 cycles at 94°C for 45 s, 57°C for 30 s and 72°C for 45 s, and final extension for 5 min at 72°C. Then, the amplicons of target DNA were examined on agarose gel electrophoresis. RT-PCR band was excised from the agarose gel and extracted using QIA-quick Gel Extraction Kit (Qiagen, Valencia, CA, USA). PCR product obtained from gel was cloned directly into pGEM-T Easy Vector (Promega, Madison, WI, USA). Plasmids were transformed into competent cells, TOP 10F′ (Invitrogen, Carlsbad, CA, USA) by chemical transformation. Transformants were color-screened on Luria-Bertani medium with 50 μg/ml ampicillin, 0.1 mM isopropyl β-D-1-thiogalactopyranoside and 40 μg/ml X-gal, overnight at 37°C and the presence of the expected inserts confirmed by colony PCR. Plasmids were purified with High Pure Plasmid Isolation Kit (Roche, Basel, Switzerland). These plasmids were verified by sequencing and plasmid containing the inserts was linearized using restriction enzyme ApaI. Transcripts were generated from an upstream promoter using SP6 RNA polymerase, RNasin ribonuclease inhibitor and Riboprobe in vitro Transcription Kit (Promega, Madison, WI, USA) with 1 μg of linearized template DNA in a final reaction volume of 20 μl according to the manufacturer’s instructions. To remove plasmid DNA, RNasefree DNase was treated and the RNA copy number was estimated by UV spectroscopy at an optical density of 260 nm, using 108,968.6 as the estimated molecular weight of each deoxynucleotide and Avogadro’s number to give copies per mole. Real-time NASBA was carried out in 20 μl reactions using reagents from the NucliSens® basic kit, which is the volume recommended by the basic kit protocol. NASBA reactions were started by mixing 5 μl of extracted nucleic acid and 10 μl of NASBA mix in microtubes. The reaction mixture consisted of 40 mM Tris HCl (pH 8.5), 12 mM MgCl2, 60 mM KCl, 5 mM dithiothreitol, 15% v/v dimethyl sulfoxide, 1 mM dNTPs, 2 mM each of rATP, rUTP and rCTP, 1.5 mM rGTP, 0.5 mM inosine 5′-triphosphate (ITP), 30 μM 3 primer P1, 30 μM primer P2, and 10 μM molecular beacon. To increase the yield of NASBA products, 2 mM ITP was added in the tubes, because of GC-rich and intramolecular base paired structure of ASSVd (Nakahara et al., 1998). Subsequently, the reaction mixtures were incubated at 94°C instead of the standard 65°C for 2 min for denaturation, followed by incubation at 65°C for 5 min and 41°C for 5 min. Then, 5 μl of enzyme mix consisting of 375 mM sorbitol, 2.1 μg bovine serum albumin, 0.08 U RNase H, 32 U T7 RNA polymerase and 6.4 U AMV reverse transcriptase was added to each tube. The tubes were centrifuged briefly in a microcentrifuge to collect the enzyme mix. After tapping gently, the tubes were incubated at 41°C for 150 min. Molecular beacon labeled with FAM was excited at 485 nm, and fluorescence emission was detected at 530 nm. The sequences were aligned for fourteen ASSVd isolates including Korean isolate that we cloned (Fig. 1). Our cloned sequence had 100% homology with the sequence of ASSVd-K (AF421195) reported by Lee et al. (2001). Molecular beacon ASSVd-MB was designed to carry 5′ end and 3′ end sequences of 7 nucleotides complementary to each other and internal sequence of 23 nucleotides complementary to the ASSVd specific NASBA product to hybridize. Secondary structure was confirmed to form hairpin-like loop shape at 41°C using mfold DNA folding program. To develop real-time NASBA assay, we designed specific primers and molecular beacon for ASSVd, and then these primers were tested for the best performing reaction. The second step was to find out optimal KCl and ITP concentrations for amplification. For the following steps, twenty samples which were confirmed to be negative for ASSVd were analyzed to define the threshold level for detection. To define the optimal primer concentration, we examined fluorescent signals ranging from 20 to 60 μM (Fig. 3A). The primer concentration with the highest analytical sensitivity or with the highest signal should be regarded as the optimal primer concentration for detecting ASSVd. The optimal primer concentration was found to be 30 μM. 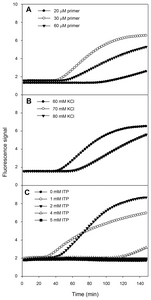 Optimal KCl concentration, respectively for corresponding primer pair and ITP concentration was 60 mM (Fig. 3B) and 2 mM (Fig. 3C). This assay was optimized at 60 mM KCl, 30 μM primers, 10 μM molecular beacon and 2 mM ITP. The specific primers target and amplify the sequence from ASSVd found in apple fruits. In order to reflect as reliable as possible whether a given sample is positive or negative for ASSVd, 20 samples confirmed to be negative for ASSVd were analyzed in four different runs using real-time NASBA. From the highest and lowest baseline fluorescence signals, the ratio and average baseline fluorescence could be used to calculate the threshold level. Subsequently, we have decided threshold level for detection of ASSVd at 1.414 (data not shown). The above developed assay could be applied quantitatively by assuming the amount of unknown RNA samples from the standard curve constructed with the known amount of RNA molecules. To construct standard curve based on time-to-positivity (TTP) values, indicating the cycle number in which amplification first enters a logarithm phase like Ct value in realtime PCR, dilution series of ASSVd RNA standard were prepared ranging from 1×104 to 1×1012 copies/μl. The fluorescence signals of in vitro synthesized ASSVd RNA were shown in Fig. 4. The intervals between TTP values were consistent over a range of at least six orders of magnitude of RNA molecule from 1×1012 to 1×107, as shown by the decimal dilution series. The limit of detection was determined at 1×105 RNA copies for 150 min. A standard regression line was constructed by plotting the TTP values versus the logarithm of the starting ASSVd RNA copy number of 10-fold dilution each. The number of RNA copies present in the reaction was indicated on the X axis and the TTP value in indicated on the Y axis. TTP values were inversely correlated with the initial copy number of ASSVd RNA. The higher the ASSVd RNA, the less reaction time needs to amplify to a detectable level. For the data ranging from 1×107 to 1×1012 copies, the TTP value was the mean of three independent experiments. Starting template copies lower than 1×107 were not consistently amplified. The linear quantification was made between 1×107 to 1×1012 RNA copies (R2 = 0.99, P < 0.0001). Two different molecular detection systems were compared to verify their performance and analytical sensitivity by using the same diluted RNA samples. 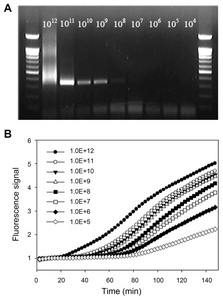 General RT-PCR and real-time NASBA were performed according to the established and developed methods above (Fig. 5). With RT-PCR, the detection of ASSVd was obtained up to approximately 1×108 copies. However, the band was smeared at 1×1012 copies/μl and quite obscure in 1×108 fold dilution. On the other hand, relative fluorescence with dilution series by real-time NASBA could be detect up to 1×105 folds and more sensitive than the established RT-PCR method. In this study, we reported NASBA assay with real-time detection of ASSVd by molecular beacon using the NucliSens ® Basic Kit, which is an alternative to the existing detection methods. RNA extraction using NucliSens® Lysis Buffer and Isolation Reagents (silica), which was based on the methods of Boom et al. (1990), was more convenient to isolate RNA than other extraction kits. Especially, this isolation method is easy and speedy during high-throughput processing to even non-experienced experimenters. However, this kit was not manufactured anymore according to the company policy. Therefore, we were utilizing Nucli-Sens® easyMAG® system in the present study. Real-time NASBA assay developed in this study was optimized to detect ASSVd exquisitely according to the guidance in development of in-house NASBA assay of manufacturer’s recommendations. The assay mixture was composed of 60 mM KCl, 30 μ 3 primers, 10 μM molecular beacon and 2 mM ITP. Additional ITP was known to increase the efficiency to swell NASBA products which have GC-rich and intramolecular base-paired viroid RNA (Nakahara et al., 1998). Substitution to “I” from “G” in the sequences was not a serious problem to real-time detect by using molecular beacon. Real-time NASBA assay was compared to parallel RT-PCR assay with respect to detection limits. The results showed that the real-time NASBA assay developed was more sensitive and specific than RT-PCR analysis for the detection of ASSVd in apple trees. Furthermore, this method was faster to perform than RT-PCR and more reliable to detect ASSVd. A set of RNA samples could be analyzed within 2.5 h by real-time NASBA, faster than RT-PCR method combined with gel electrophoresis and imaging. The employment of molecular beacon permitted precise diagnosis in a single tube, without electrophoresis on gel, imaging and contamination risk. RT-PCR could detect as little as 1×108 copies/μl, and was able to analyze in 1×1011 copies/μl of in vitro synthesized RNA. However, PCR band was smeared at 1×1012 dilution, because too many RNAs were included in samples. In the case of 1×108 fold dilution, the ASSVd band was barely visible, because RNA was not sufficient to reverse-transcribe or to amplify by polymerase. On the other hand, the real-time NASBA with molecular beacon could detect from 1×1012 to 1×105 copies of ASSVd RNA. The fluorescence signal at 1×104 fold dilution could also be detected within 150 min (data not shown), even with low reproducibility. ASSVd in samples could be quantified by comparing the TTP value of each sample to the TTP values from the standard regression lines. The amount of starting template in any NASBA reaction, expressed as the copy number of the target ASSVd RNA in the original plant extract, could accurately be determined. The limit of quantification (LOQ) for detection of ASSVd was determined at 1×107 RNA copies from the results. According to this result, routine diagnosis through above real-time NASBA had better to perform within 90 min than 150 min to detect ASSVd, resulting from range of LOQ. The real-time NASBA assay is easier to use and more specific and faster to detect ASSVd in apple trees compared to RT-PCR assay. Furthermore, this assay might especially be useful for detecting low levels of viroids in apple trees at early infection stage and for monitoring their influence on tree growth. Therefore, this assay might be suitable for high-throughput diagnosis and automation like quarantine, certification and breeding programs for viroid resistance in apple trees. This research was funded by Rural Development Administration, Korea. The sequences of primer and molecular beacon developed in this study were applied for a patent in Korea by the Rural Development Administration and assigned to the application 10-1024493. Fig. 1. Nucleotide sequence alignments of ASSVd isolates and the position of ASSVd-specific primers and molecular beacon. Comparison of the nucleotide sequences of ASSVd isolate collected from ‘Hongro’ cultivar at the orchard of NIHHS with ASSVd-K (Korean strain, accession AF421195), A-4 (DQ362907), B-9 (DQ362906), AM1 (EU031455), A1 (HG764204), B1 (HG764201), C1 (HG764197), C2 (HG764198), C3 (HG764199), C4 (HG764200), T1 (HG764202), P1 (HG764203), N1 (HG764205). ASSVd isolate which identified in this study had 100% sequence homology with ASSVd-K. Identical nucleic acid residues are shown in black, whereas dashes indicate gaps in the nucleotide sequences introduced to optimize alignment. The primers and molecular beacons sequences for ASSVd are indicated by red rectangles. Fig. 2. A dendrogram which constructed from the sequences of ASSVd isolates; accessions K (AF421195), B-9 (DQ362906), A-4 (DQ362907), AM1 (EU031455), AM2 (EU031456), PP1 (EU031467), PE1 (EU031477), AP1 (EU031487), C1 (HG764197), C2 (HG764198), C3 (HG764199), C4 (HG764200), B1 (HG764201), T1 (HG764202), P1 (HG764203), A1 (HG764204), N1 (HG764205), ap (HQ840722), and ADFVd (NC_003463), CBLVd (M74065), and PBCVd (NC_001830) belong to the genus Apscaviroid. It was constructed by the maxium likelihood method based on Tamura-Nei model with 1,000 bootstraps. Fig. 3. Sensitivity of ASSVd real-time detection using molecular beacon to determine the optimization of the assay. Optimization of (A) the primers, (B) KCl and (C) ITP concentration with the highest fluorescent signal or the lowest time to positive (TTP) value. Fig. 4. The standard curve of ASSVd RNA using real-time NASBA. 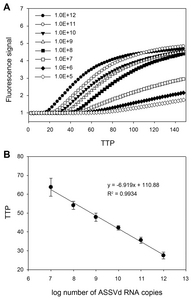 (A) Real-time NASBA amplification plot based on TTP value versus fluorescence. (B) Relationship of TTP to ASSVd RNA copy number. Fig. 5. Comparison of sensitivity to detect ASSVd RNA molecules by RT-PCR and real-time NASBA. (A) End-point detection of ASSVd by RT-PCR. (B) Relative fluorescence with a dilution series by real-time NASBA. aThe primers for RT-PCR were reported by Lee et al. (2001). *Underlined letters indicate the T7 RNA polymerse promoter-binding region. Lowercase letters are the specific binding sequences to ASSVd RNA. Boom R, Sol CJ, Salimans MM, Jansen CL, Wertheimvan Dillen PM, and van der Noordaa J. 1990. Rapid and simple method for purification of nucleic acids. J Clin Microbiol 28: 495-503. Compton J. 1991. Nucleic acid sequence-based amplification. Nature 350: 91-92. Flores R, Randles JW, Bar-Joseph M, and Diener TO. 1998. A proposed scheme for viroid classification and nomenclature. Arch Virol 143: 623-629. Hassan M, Myrta A, and Polak J. 2006. 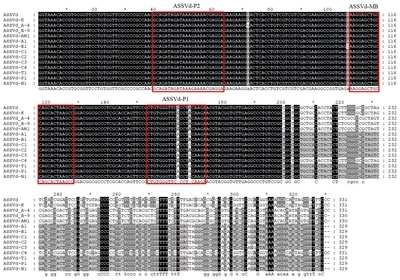 Simultaneous detection and identification of four pome fruit viruses by one-tube pentaplex RT-PCR. J Virol Methods 133: 124-129. Hibbitts S, Rahman A, John R, Westmoreland D, and Fox JD. 2003. Development and evaluation of Nuclisens® basic kit NASBA for diagnosis of parainfluenza virus infection with ‘end-point’ and ‘real-time’ detection. J Virol Methods 108: 145-155. Kim HR, Lee SH, Lee DH, Kim JS, and Park JW. 2006. Transmission of Apple scar skin viroid by grafting using contaminated pruning equipment and planting infected seeds. Plant Pathol J 22: 63-67. Koganezawa H, Yang X, Zhu SF, Hashimoto J, and Hadidi A. 2003. Apple scar skin viroid in apple. In: Viroids, eds. by A. Hadidi, R. Flores, JW. Randles, and JS. Semancik , pp. 137-141. CSIRO Publishing, Collingwood, Australia. Kumar S, Stecher G, Li M, Knyaz C, and Tamura K. 2018. MEGA X: Molecular evolutionary genetics analysis across computing platforms. Mol Biol Evol 35: 1547-1549. Kwon MJ, Hwang SL, Lee SJ, Lee DH, and Lee JY. 2002. Detection and distribution of apple scar skin viroid-Korean strain (ASSVd-K) from apples cultivated in Korea. Plant Pathol J 18: 342-344. Lee JH, Park JK, Lee DH, Uhm JY, Ghim SY, and Lee JY. 2001. Occurrence of apple scar skin viroid-Korean strain (ASSVd-K) in apples cultivated in Korea. Plant Pathol J 17: 300-304. Lee SH, Kim YH, and Ahn JY. 2016. The detection and diagnosis methods of infectious viroids caused plant diseases. J Life Sci 26: 620-631. Lee SH, Ahn G, Kim MS, Jeong OC, Lee JH, Kwon HG, Kim YH, and Ahn JY. 2018. Poly-adenine-coupled LAMP barcoding to detect Apple scar skin viroid. ACS Comb Sci 20: 472-481. Liu FC, Chen RF, and Chen YX. 1957. Apple scar skin disease . Academia Sinica Printery, Beijing, China. 43 pp (in Chinese). Menzel W, Zahn V, and Maiss E. 2003. Multiplex RT-PCR-ELISA compared with bioassay for the detection of four apple viruses. J Virol Methods 110: 153-157. Nakahara K, Hataya T, and Uyeda I. 1998. Inosine 5′-triphosphate can dramatically increase the yield of NASBA products targeting GC-rich and intramolecular base-paired viroid RNA. Nucleic Acids Res 26: 1854-1855. Németh M. 1986. Virus, mycoplasma, and rickettsia diseases of fruit trees . Springer, Netherlands, Dordrecht, The Netherlands. 750 pp. Shamloul AM, Faggioli F, Keith JM, and Hadidi A. 2002. A novel multiplex RT-PCR probe capture hybridization (RT-PCR-ELISA) for simultaneous detection of six viroids in four genera: Apscaviroid, Hostuviroid, Pelamoviroid, and Pospiviroid. J Virol Methods 105: 115-121. Vašková D, Špak J, Klerks MM, Schoen CD, Thompson JR, and Jelkmann W. 2004. Real-time NASBA for detection of strawberry vein banding virus. Eur J Plant Pathol 110: 213-221. Yang X, Hadidi A, and Hammond RW. 1992. Nucleotide sequence of apple scar skin viroid reverse transcribed in host extracts and amplified by the polymerase chain reaction. Acta Hortic 309: 305-309. Zuker M, and Stiegler P. 1981. Optimal computer folding of large RNA sequences using thermodynamics and auxiliary information. Nucleic Acids Res 9: 133-148.